"Winter Dressing", Gombar, oil, 14"x20"
Persevere is not my favorite word. I think of work with little indication of success. These are new Rich Gombar paintings. Rich paints atmosphere and light with maybe some building thrown in. Rich has been painting in this vein since college, quite a few moons ago. Sometimes I get a painting from Rich and the back has two or three dates on it, often spanning decades. 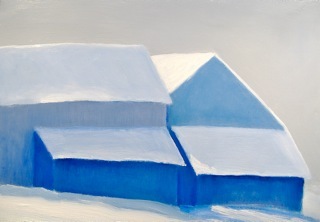 A simple landscape with a barn and it took him twenty years to get it right. 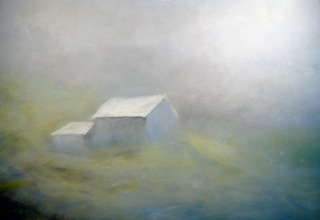 Of my painters, Rich’s simple landscapes are the ones that prompt people to ask me how long did it take him to do that? The thought being that the simplicity of forms in the painting equals its ease of execution. What is harder to detect is the subtle working of the paint, how just the right light quality is rendered without much ado. Painting like this is like watching a plant grow, without access to trick photography nothing much seems to be happening. Growth in many aspects of our lives is like that, persevere, endure, persevere. Gombar’s paintings mark the great beauty we sometimes glimpse for our efforts. "Light in August", Gombar, oil, 24"x36"